Growth rate: Slow to rapid depending on growing conditions. Mature Size: 4-12' high and somewhat wider. Flowers: Tiny, white to pink to lavender, clustered on terminal spikes. Bloom: Late spring to early summer. Watering and moist soil discourage blooming. Leaves: Green, oval, smooth margins, fleshy, edible with a slightly sour flavor, high in vitamin C. Several cultivars have variegated leaves. The leaves regrow quickly after being browsed. Stems: Woody and succulent, green to dark red, easily broken, no thorns. Broken branches fallen on the ground may take root. Wildlife: The flowers attract bees. The leaves may attract browsing animals and are a favorite of tortoises. USDA hardiness zones: 9-11. Hardy to 25°F after becoming established. Sun: Full sun to part shade. Avoid full shade. Water after becoming established: Weekly in the hottest months of the year, monthly at most in winter. Soak the soil, then allow it to dry completely before watering again. Do not water before or during the weeks it is scheduled to bloom or it will fail to flower. Soil: Well drained, dry, low in organic content, sandy, somewhat tolerant otherwise. Fertilizing or enriched soil can prevent this plant from flowering. Mulch: Mulch only in freezing conditions during the first three years. Remove mulch by mid spring so the soil will dry faster. Moist soil inhibits blooming. First Year Care: Protect from freezing the first two or three years. Planting: Can be grown in containers, and indoors, and used for bonsai. Prune: Trimming is rarely needed and should be done only to shape. It can be pruned into a hedge. Pests: In Africa, it is foraged heavily by elephants, cattle, and other large animals. Uses: Ornamental, food source, erosion control. The edible leaves are used in salads and soups. This plant is a member of the Porkbush family (Didiereaceae). It was previously assigned to the purslane family (Portulacaceae). 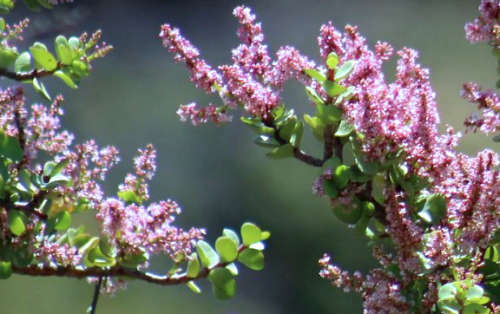 Other common names are Pork Bush, Elephant Bush, and Spekboom (Afrikaans for bacon tree). This plant has the distinction of being a high carbon-sink plant, removing more carbon dioxide from the air during photosynthesis than most other plants. This plant often does not flower in cultivation because it should not be grown in enriched soil or fertilized and the soil must be entirely dry before it is scheduled to bloom.